I wish summer would stay a bit longer. But fall also means delicious pumpkin recipes, so we gotta concentrate on the good things, right? 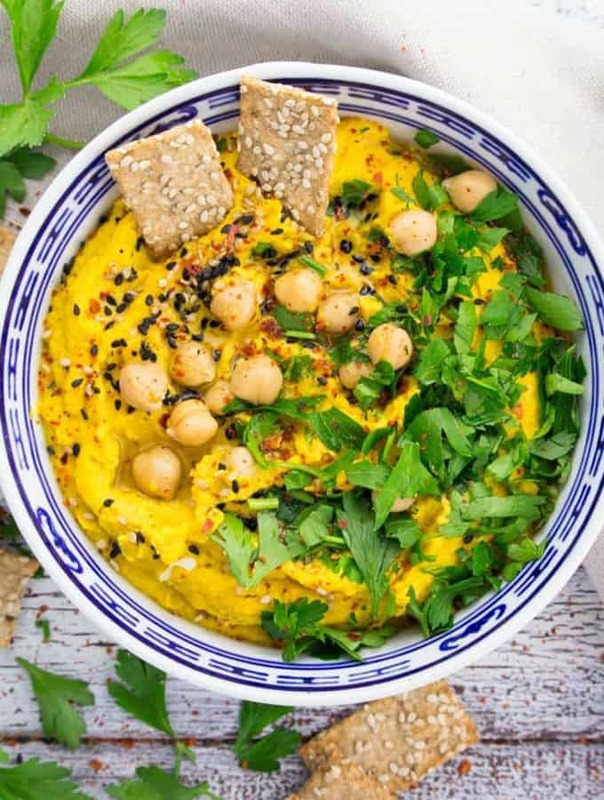 And this pumpkin hummus is definitely one of them! 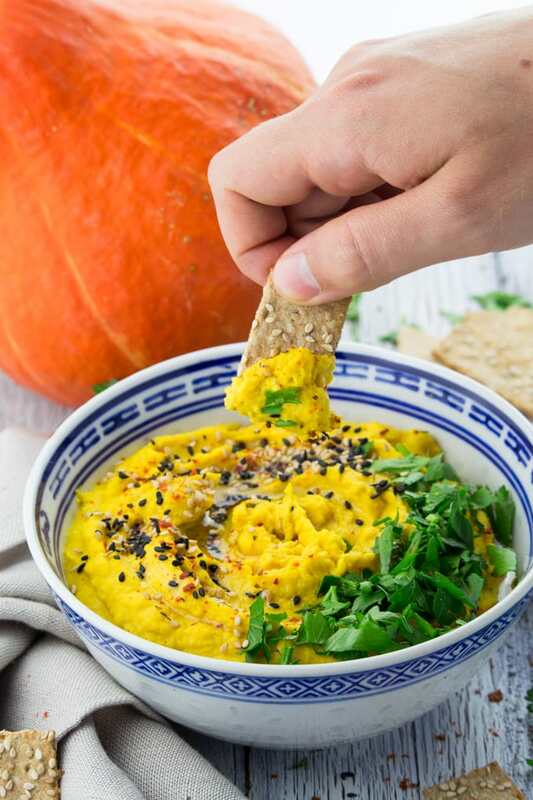 I love hummus in general, but this pumpkin hummus is a real treat! STEP 1: Either use store-bought pumpkin puree for this recipe or make your own. 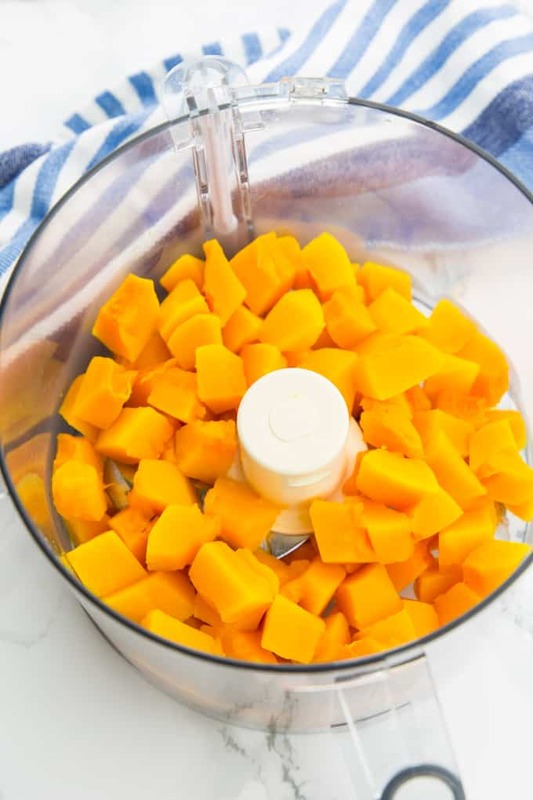 If you want to make your own, place cooked pumpkin cubes in a food processor and pulse until smooth. I like to prepare them in my Instant Pot. STEP 2: Then make the pumpkin hummus: Again, put all ingredients in a food processor and process until smooth. I prefer using a small food processor over a high speed blender for hummus. STEP 3: Top with fresh parsley, sesame seeds, red pepper flakes, and olive oil. 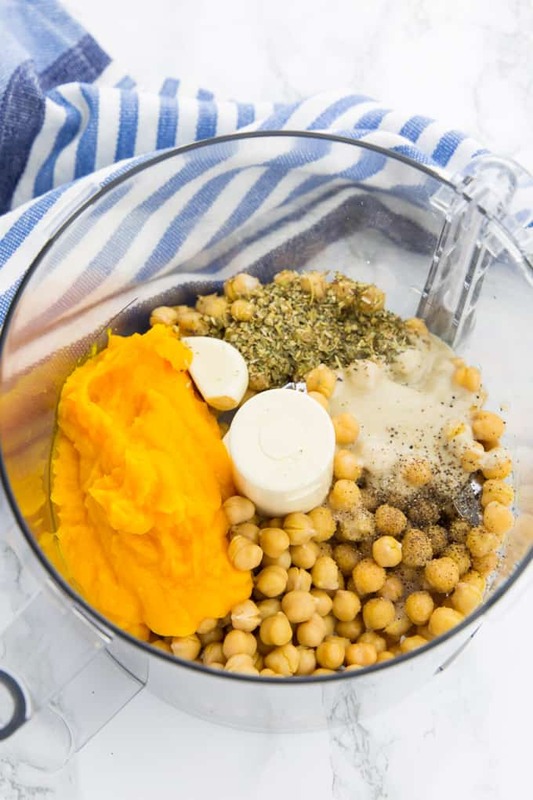 This easy hummus with pumpkin is super versatile. I love making it for parties and family get-togethers in the fall. I love hummus the whole year round! 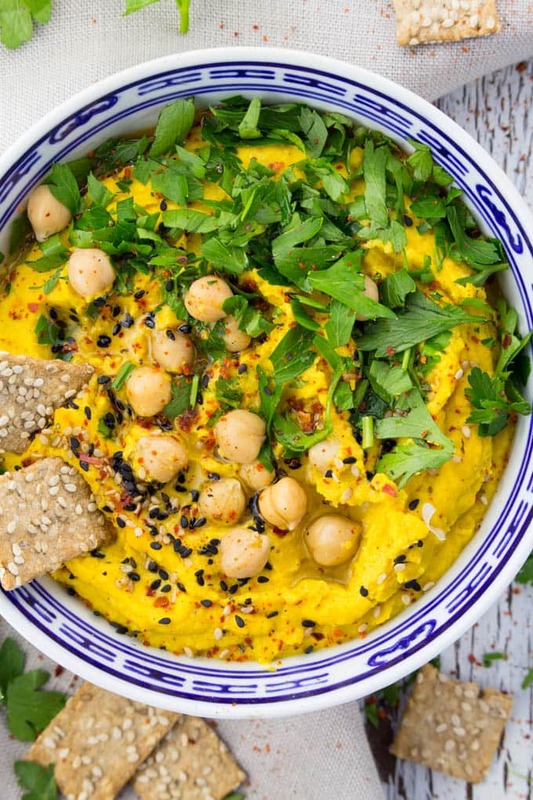 For more delicious flavors, check out this roundup of 20 amazing hummus recipes. I used canned chickpeas for this recipe, but of course you can also use dried chickpeas that you cook yourself if you want. Usually, I make them in my Instant Pot. I love topping the pumpkin hummus with lots of fresh parsley, sesame seeds, and red pepper flakes. You can easily make it the day before serving it. Just store it in an airtight container in the fridge and it will stay fresh for about 3-5 days. I recommend making this hummus in a food processor not a blender. It’s way easier to clean and it handles small amounts of food better than a big high-speed blender. Maybe you’ve got a lot of hummus and can’t finish it. Good news! Freezing hummus is absolutely no problem! You can freeze it for up to 6 months. Just freeze your hummus in an air-tight container. Either in a big one or several smaller containers for individual servings. Because the hummus will expand when it freezes, don’t fill it all the way to the top. When you want to eat it your hummus, simply take it out of the freezer and thaw it in the refrigerator overnight. You will probably notice some liquid on top. Don’t worry, this is normal as the hummus separates a bit when being frozen. Just stir it with a spoon and serve it as you would fresh hummus. You might want to add some more spices, garlic, or red pepper flakes on top. And it’s also great with some fresh herbs such as parsley and sesame seeds. Or maybe even with a bit of olive oil. Traditional recipes usually call for tahini, a sesame seed paste. I love its nutty flavor. Besides, it’s super healthy and packed with nutrients. It’s for example one of the best calcium sources out there. However, tahini also has a touch of bitterness, so some people (especially kids) aren’t the biggest fans of it. But the fact that you don’t like tahini doesn’t mean you can’t enjoy hummus. You can easily leave it out! Maybe you even got a sesame allergy and can’t eat regular hummus at all. Leaving out the tahini will change the flavor a bit, but it will still be super delicious and nutritious! 35 Stunning Vegan Pumpkin Recipes You Have to Try This Fall! 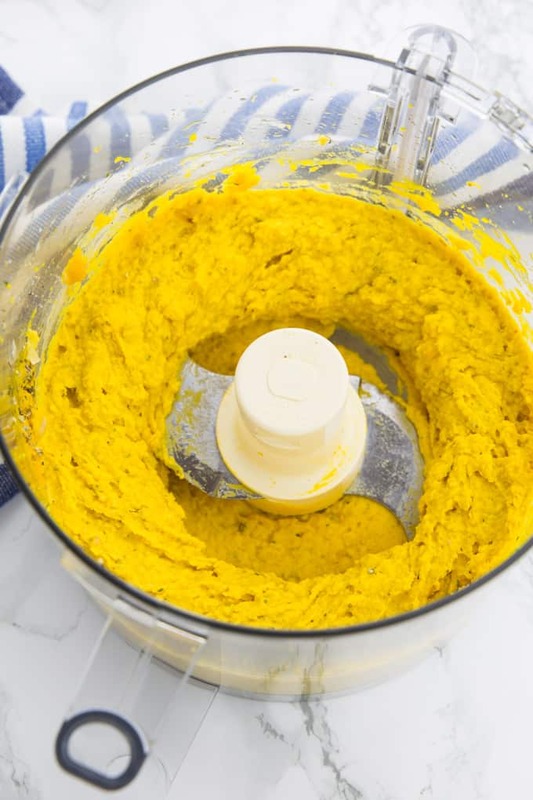 I hope you like this pumpkin hummus recipe as much as we do around here. This pumpkin hummus with fresh parsley and sesame seeds is the perfect fall snack. It's super delicious, packed with protein, and really easy to make! Top with fresh parsley, sesame seeds, red pepper flakes, and olive oil and serve with sesame crackers or veggie sticks. I used canned chickpeas for this recipe, but of course you can also use dried chickpeas that you cook yourself if you want. I usually make them in my Instant Pot. « Vegan Banana Bread – 15 Amazing Recipes! This looks great! I love the vibrant color it turned out. I can never get enough hummus and this sounds like the perfect way to welcome fall. Looks delicious! This looks delightful! 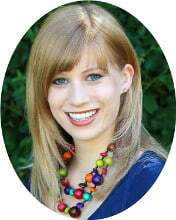 Fall is my favorite time of year, so I was ready to say good-bye to summer. I’ll be sorry once winter rolls in, but for now, I’m loving it. I’m so sorry you had to deal with some rude people at the festival. Some people just like to hear themselves talk and try to make themselves feel better by putting others down. BUT, glad the overall vibe was positive. So, that is awesome! 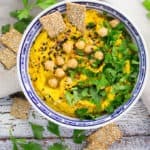 I think my kids would love this pumpkin hummus – they love all things hummus! This is gorgeous, and it’s such a creative use of pumpkin! 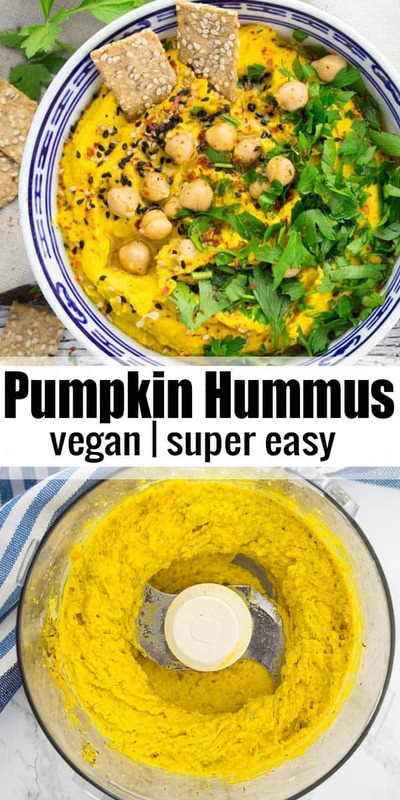 Great fall twist to hummus! I can see this going great with some hearty crackers. YUM! What a great twist on traditional hummus. it looks great! 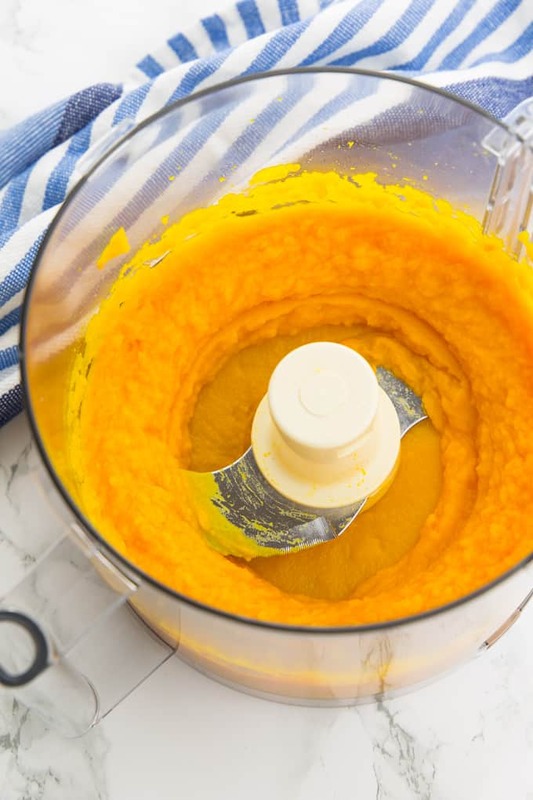 Is the pumkin purée raw or coocked ? Hi Marion, the pumpkin puree is cooked. :-) Just cut the pumpkin into small cubes and cook it until it’s soft. No need to add salt or vegetable broth. Hope that helps! Sounds wonderful! Just wondering how far in advance can this be made?